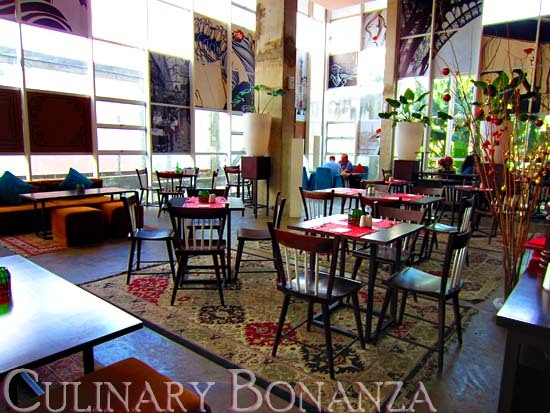 I've seen Madeleine Bistro's reviews on other blogs: Gastro Afficionado, JenzCorner and GoodFoodGoodLife. The reviews were positive and the photos looked really inviting, so I told myself that I just had to try it someday. Alas, the opportunity presented itself when I saw the promotion disdus.com, it was such an awesome deal, that I hit the "buy" button without further ado! 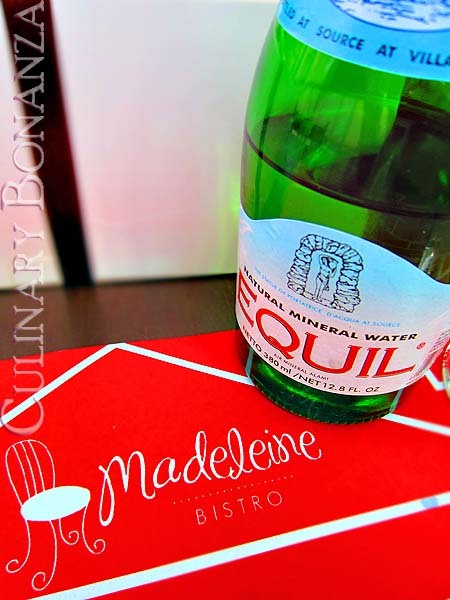 Madeleine Bistro, as the name suggests, is a French-dining establishment. 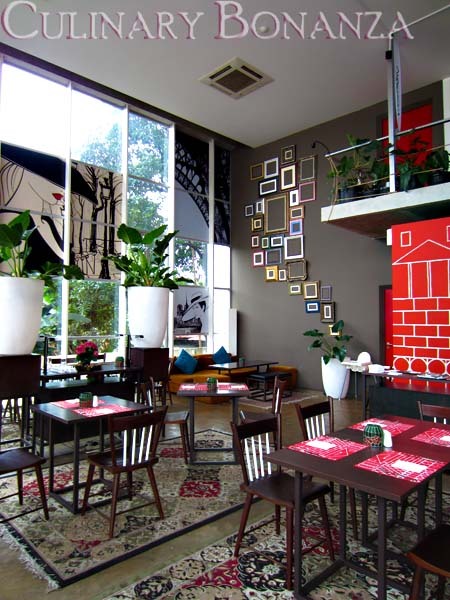 It is comparatively new, but it's rapidly gaining popularity among both locals and foreigners. At the time of my visit, it was slightly late for lunch, so the bistro was quite idle. But the leftover patrons were from different walks of life, from expats to local celebrity (Sari Nila was there with her group of friends when I visited). I was so happy as it was just the perfect setting for taking photos of the fancy & romantic French-style interior as you can see below. A complimentary bread basket came first with Madeleine's home-made herbed butter. Oh dear, I fell in LOVE with the butter, I even asked if it's sold separately! It is the best herbed butter I've ever had in my entire gastronomic life! 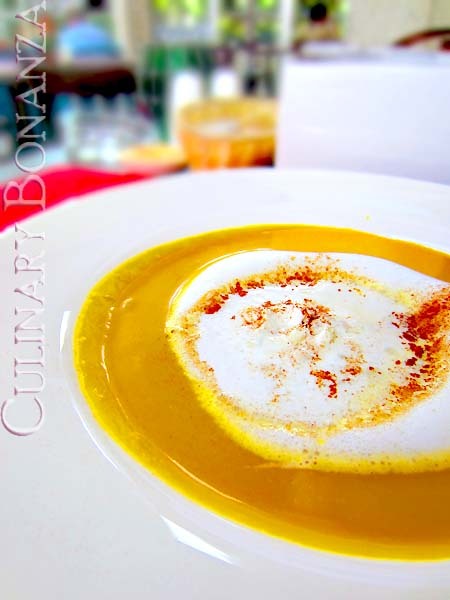 From the selection of entrées, I opted for the curious one: Potage de Potiron et Rillettes de Celeri, which is simply a yellow pumpkin soup with celery bits and topped with cinnamon foam. Oh, FYI: entrée has different meanings, depending on which part of the world you're at. Curious? Find more info here. What about the soup? It was savoury, but tends to be sweet, it is pumpkin after all. The cinnamon foam made the soup seem even sweeter. The soup was finely done, but perhaps it didn't suit my palate at that time. In the French dining culture, a sherbet is served to neutralize your taste buds after the entrée and before le plat principal (main course). 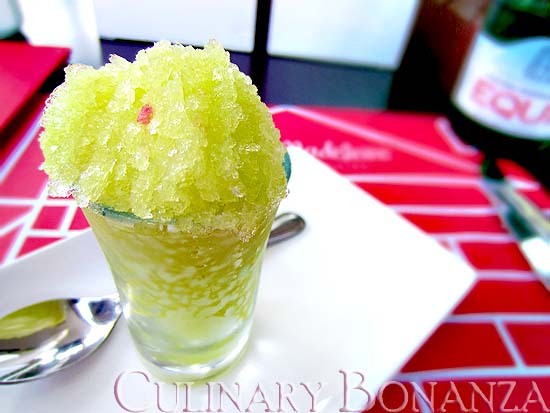 Madeleine served this refreshing & lightly sweetened pineapple sherbet. And next, came the main course: Faux Filet de Boeuf Sauté. I had one scoop and immediately understood why such a fine dish was one of the popular dishes here. 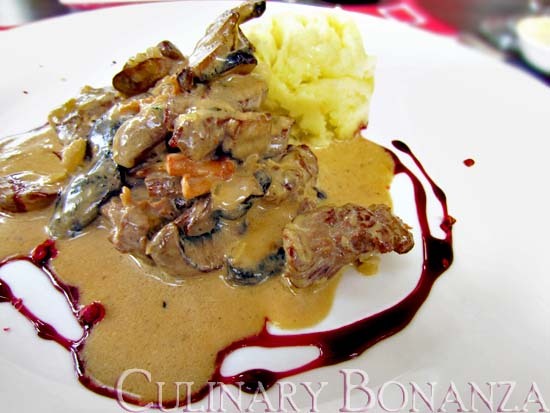 The sauteed striploin mixed perfectly with the rich creamy mushroom gravy. And ah, the scent of the white truffle oil was addictive! (I'm a mushroom fan through & through =P) The entire ensemble was a real treat to the senses! The Warm Cherries Jubilee was another popular item here. 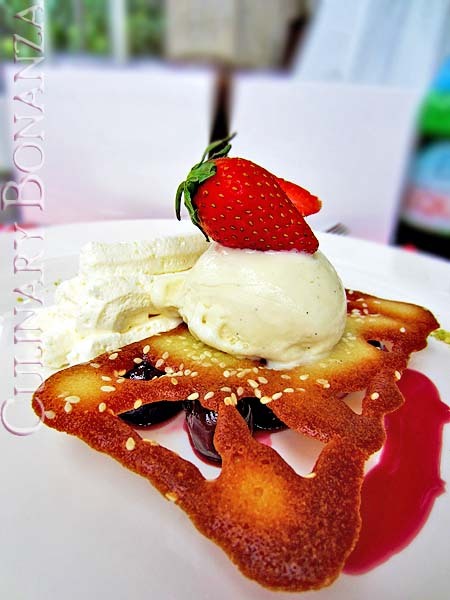 Can you see the dark cherries confit under the thin biscuit (actually the proper name is tuile in French, which means thin & crisp cookie)? Yes, that is the main star of this whole ensemble. Yes, noted, will update you accordingly Jeff. They do serve good food (especially the meat selections), however they take a very long time to serve the foods. It took about 1 1/2 hour to get our main courses. We ended up eating about 6 basket of bread to please our tummies. I think they need more man power (either for the waiters or the cooks) especially during weekends. @Anonymous: Wow! Really?? 90 minutes for the main course is just too overboard! Well, it is true that Madeleine is not famous for the speedy service. But I guess your input: adding manpower on weekends, makes all the sense. Thanks for sharing! Totally agree with you! The herbed butter is a SIN! haha...couldn't stop dipping my bread into it over and over again. i heard it is a good-recommended french restaurant. and now i read it here. well, i'll pay a visit one day.